The dress is gorgeous! Beautiful just like the photos. The dress coming with surprising good quality. The service is great. They emailed me to confirmed my order after I ordered the dress and answered my questions promptly. All in all I love the dress! Thank you. Dress is made very well, beautiful fabric and workmanship. Elegant just as pictures shown. My bridesmaid love it just as I do. And It's easy to put on that I can do it all by myself. I love this dress so much. Thank you MillyBridal! would like to buy more here!! Just received this beautiful dress in silver today for my wedding. It? ?s just beautiful and fits perfect. Just to long have to have it hem but that? ?s no problem. Can? ?t go wrong with this one. First time I? 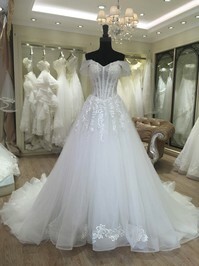 ?ve ordered from Millybridal UK and will again. I was skeptical about buying this dress before but I decided to order it because it's cute and at such a low price I didn't have much to lose. But the dress is really way better than I expected it to be! Great quality and it's just beautiful! I used the custom fit option and it was perfect! As stated multiple places they will add inches to the length for heels. I didn't want this as I am rather short so I subtracted them from my height beforehand? and it fits perfectly! The shipping was just wonderful I could track it and manage to arrange to be there for delivery. All items were there. I loved the gown and my sister loved it the owner of the gown. Thanks million times. I want to order a dress again. I custom-ordered this dress and it was here within a WEEK!! I paid for normal shipping and everything. Very pleased with the promptness! AND it fits perfectly!!! I am very very satisfied with Millybridal UK and I will absolutely recommend! !